This raspberry-red rhodochrosite specimen is from the closed Sweet Home Mine in Alma, Colorado, USA, which is well known for the finest rhodochrosite. The rhombs are sharp and display good transparency and glassy lustre. Sam Yung Leung Yuen has been interested in mineral collecting for more than 20 years. In 2010, Sam established the Fine Minerals Gallery, specialising in collecting and sourcing mineral specimens to collectors and museums. 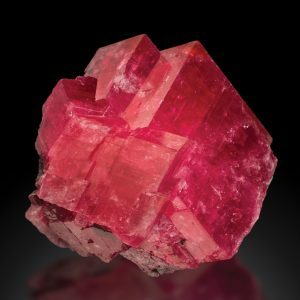 Sam is passionate about helping people to understand and appreciate the beauty of natural minerals by sharing his own collection publicly through the gallery and in publications containing superb photography of masterpieces.